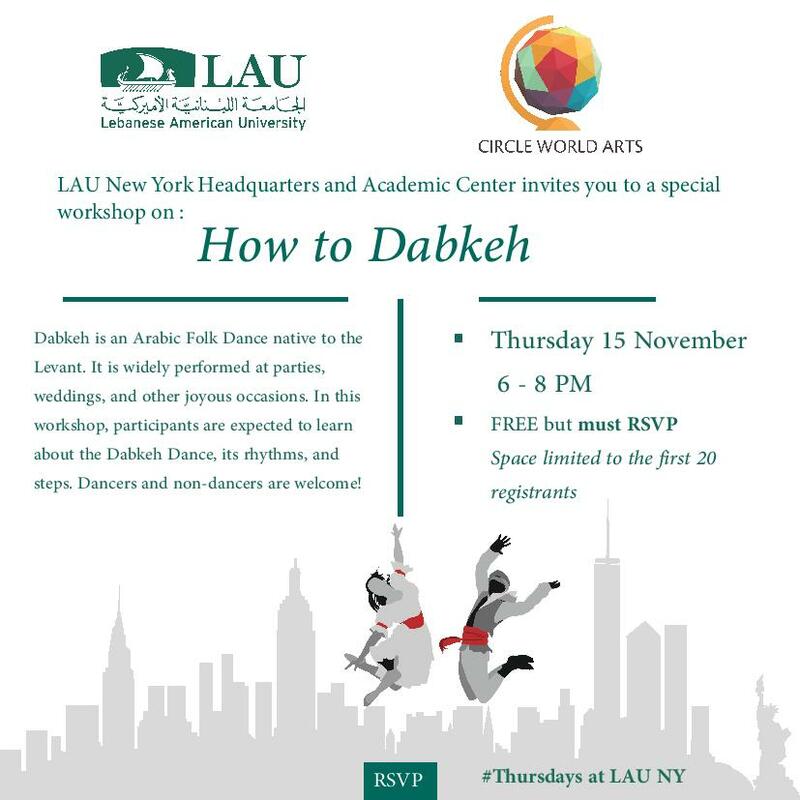 LAU NY Headquarters and Academic Center and Circle World Arts are happy to co-present Dabkeh Dance Workshop with artists Hadi and Mohamad Eldebek. Dabkeh is an Arabic Folk Dance native to the Levant. It is widely performed at parties, weddings, and other joyous occasions. In this workshop, participants are expected to learn about the Dabkeh Dance, its rhythms, and steps. This workshop is intended for anyone interested in Arabic culture, dancing, meeting new people, and having fun! You could be a complete beginner or know the basic moves and want to take it to the next step. About the instructors, Hadi and Mohamad Eldebek are musicians, dancers, and cultural entrepreneurs. They have performed in hundreds of music and dance shows and workshops around the world, including Disney World, The Kennedy Center, China’s National Center for Performing Arts, and more. They are both recipients of The TED Residency for their cultural projects, GrantPA, and Circle World Arts. Their recently published TED Talk about the importance of arts and funding artists has gained over a million views so far. Looking forward to welcoming you to our community and sharing a great learning experience with you! Since we only have twenty slots available, please make sure that you only RSVP if you are positive that you are able to attend on the day of the workshop.